Tops has one zippered plastic window. We offer it in the leather texture vinyl. 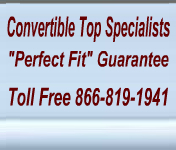 The Triumph convertible tops have excellent workmanship, superior fabrics and attention to detail that will ensure you will enjoy your convertible top for a very long time. for your new Triumph convertible top. This top fits the 1972 Triumph Stagg convertible, 1973 Triumph Stagg convertible, 1974 Triumph Stagg convertible, 1975 Triumph Stagg convertible, 1976 Triumph Stagg convertible and 1977 Triumph Stagg convertible.